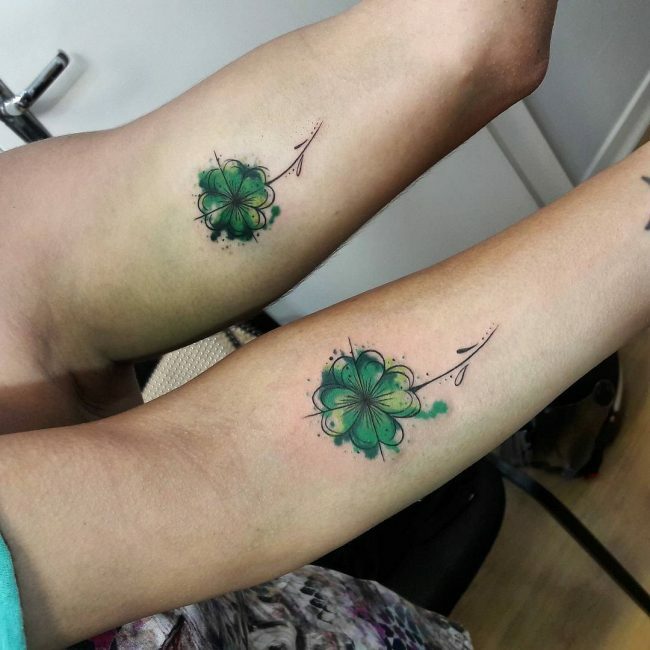 A four leaf clover tattoo is one of the top designs in the field of tattooing. This tattoo comes with elegance and it dates from many years ago. It has a special meaning and it is applied by both women and men. Also known as the Shamrock, this leaf originates from Ireland and it is also a national symbol of the nation. St. Patrick attempted to introduce Christianity in Ireland and he used the Shamrock, which is a three-leaf clover. This plant was used to symbolize the Holy Trinity, The Father, The Son and the Holy Spirit. For that, this leaf was a national symbol of Ireland. Nonetheless, the four leaf clover was found in the rolling hills in Ireland, which spread later on across the world. Anyone was considered lucky to find that clover. This is why it became more popular, due to its rarity. Basically, this tattoo symbol has been commonly used to symbolize good luck. This was the original meaning of the clover, since it was rare to find it. It is believed that you could find the leaf out of ten thousand clovers. Many then associated it with good fortune or good luck. The rarity of finding this type of leaf gave it the name, Luck of the Irish. It was commonly grown in Ireland and it was scarce in growth. It was also used as a combination of the common virtues in life. Some use it to contain four meanings the first leaf can be used to symbolize love and the second leaf represents hope. The third and the fourth leaves symbolize luck and faith. So basically, this leaf is used as a common symbol in life. Some people will apply it just for the beauty part of it. This type of clover is very elegant in its design and also, it is very unique. You can add some colors to make it more attractive or it can be applied basically with the other details. The general design of the tattoo can vary, which satisfies the major meaning of that tattoo. Since it can also be used to symbolize hope and love, it can be applied by lovers or family members. Generally, it is one of the tattoos that have special meanings that are mostly positive. 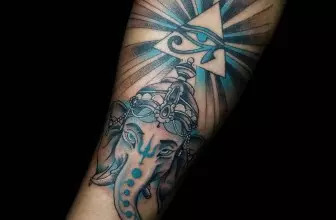 The only negative side might be when the tattoo has been applied with other symbols. When applied with symbols like skulls or other cult-based symbols, the meaning could be negative. All in all, the tattoo is used to show that the person has some sense of luck or fortune. 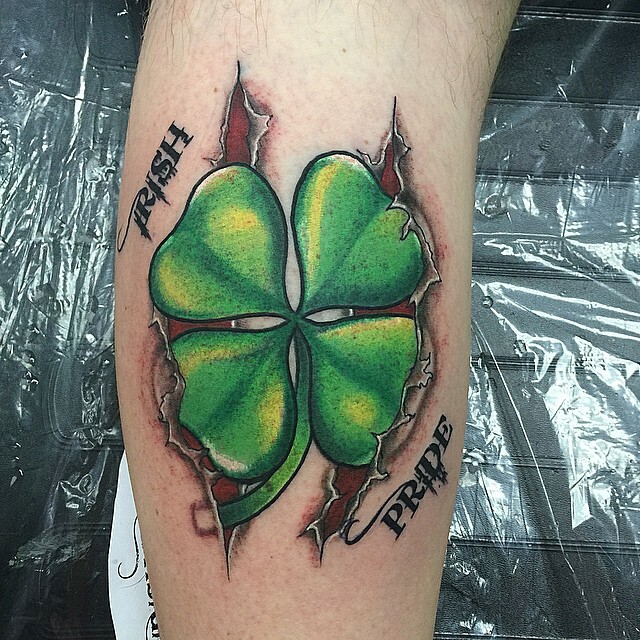 Just like any other type and design of the tattoo, the tattoo of the four-leaf clover has no limit. You can apply it anywhere you wish. The difference and consideration come when the tattoo is too large or when there are more details to be included. When the tattoo is too large, including the stalk of the clover, it will be applied on the side, the arm or the back. It can also look great on the thighs, stretching down towards the legs. Other areas for smaller sizes of the tattoos include the fingers, the wrist, the back of the ear, the neck or the ankle. 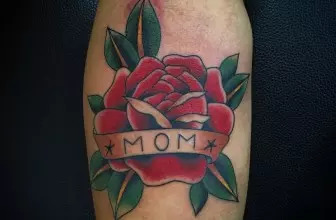 Basically, the point is to apply the tattoo in an area that it will look elegant and there will be no confusion when someone is trying to figure out what you have applied. Even though you are applying the tattoo for your own good and with your own reasons, ensure that you consider how it will appear. This is supposedly the most common type, since it is the origin of the main plant. The tattoo can contain some features like the Celtic tree of life or the Celtic Cross, which are incorporated within the clover. 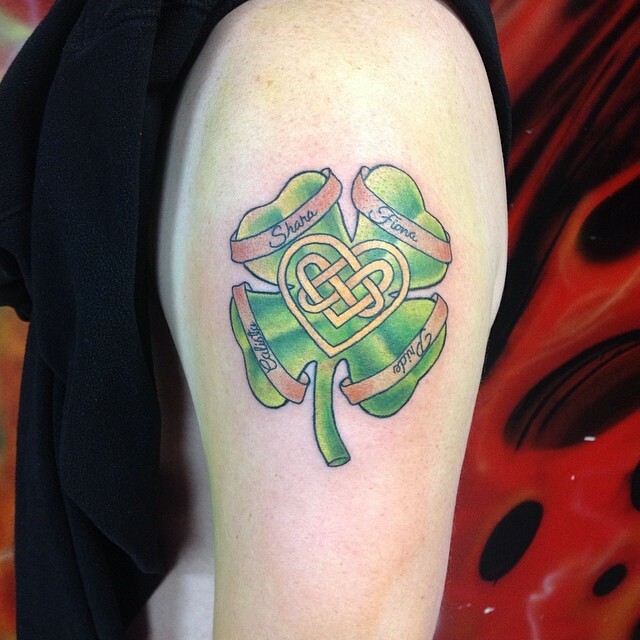 Basically, this tattoo will take the main Celtic theme and it will have the green theme. The gamblers also have these tattoos applied, for the sake of having luck in their gambling. 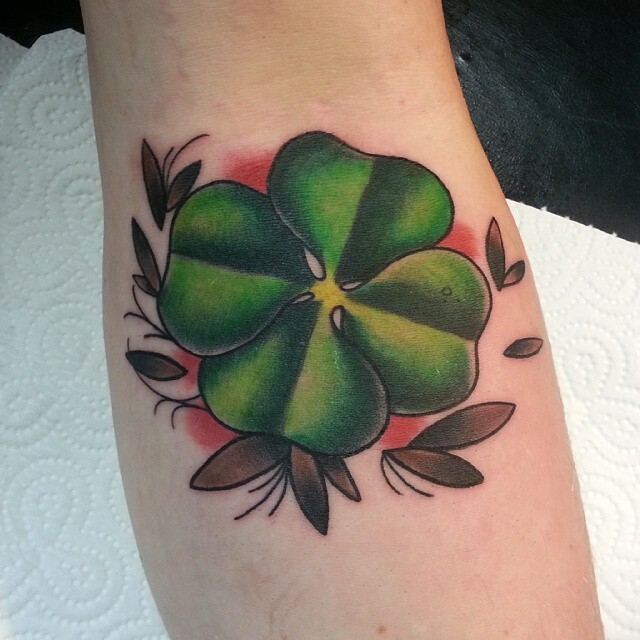 The tattoo can contain the Lady Luck as the main symbol of the clover. The Lady Luck will be used to symbolize the luck needed. This symbol can go along with some money, cards or power chips. The clover can also be applied with some dice on it. This one is also quite common and it will be used to symbolize luck with other hidden meaning. The tribal design will come with a special meaning. This is because it will contain different signs and designs of the various cultures. This tattoo can also be used, though it will not contain much detail. It can come with meanings that are well understood by the bearer. They may have the main design of the Shamrock plant or may include other symbols. This tattoo can be used to commemorate the day which Christianity was introduced in Ireland. 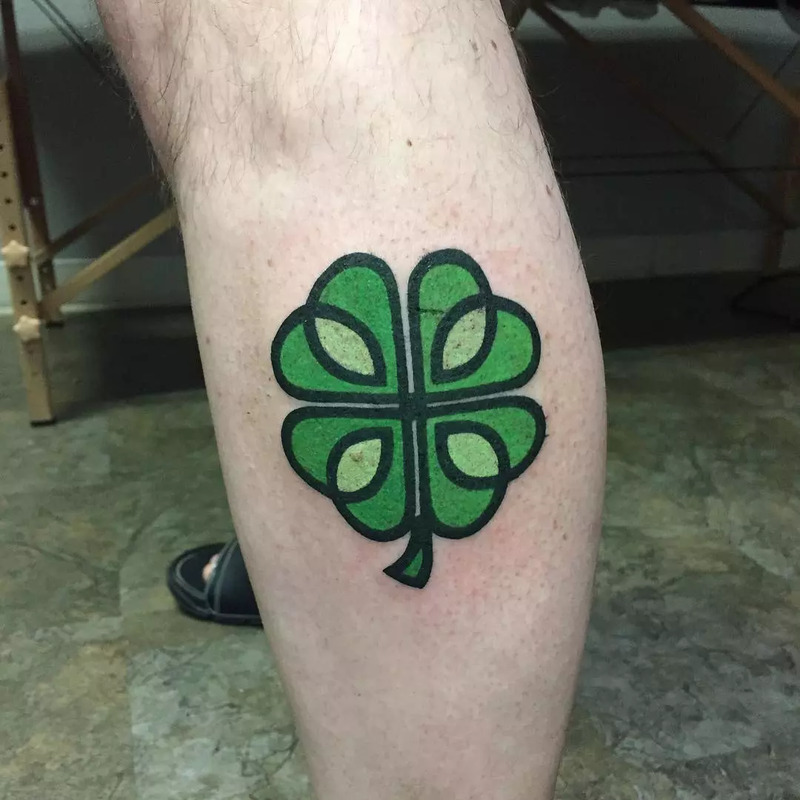 Another way of applying this tattoo is having the number 13 applied on top of the clover. It can also have the plain clover, with the word, St. Patrick Day applied. There can also be a common tattoo that has a different symbol of a family. The family could be a blood-related family, or it could be a common unit of dedicated members. For the group tattoo design, the symbols will range in design and in meaning. All in all, it could be used to mean that the group is united and that they have a particular fortune in doing something. You can also have the clover design along with some characters like the Chinese characters, the Kanji or the Japanese symbols. When you need to apply the symbols, ensure that you understand the exact meaning of such characters. You may also have a blend of colors included in the tattoo, which makes it more elegant. Nonetheless, ensure that you find a perfect artist to apply the tattoo.